Hey I read the book “The Book Thief” and it wasn’t about Cardinal Baldisseri. Still there are interesting aspects to this story. First off it was originally reported in a story by Pentin in NewsMax.com and not the National Catholic Register which is where Pentin normally has his stories published. So no doubt there were problems affirmatively sourcing the story as would be expected even if true. 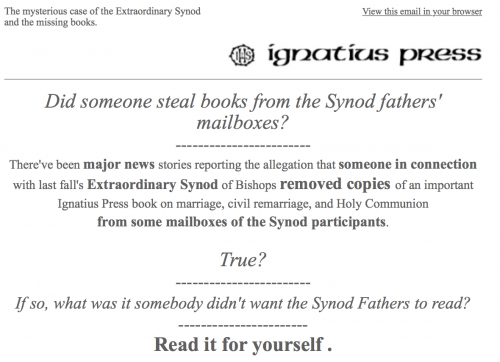 Whatever the merits of the story, I find this press release from Ignatius Press hilarious. Father Joseph Fessio, the publisher of the book’s English-language edition, maintained that the books had not been delivered. “Only a few reached synod fathers at their mailboxes in the Vatican,” he told AP. Confirmation bias tends me towards believing the story along with the fact that too often I have trusted Father Lombardi full revealing of the facts just a little less than the White House spokesman. Well that is hyperbolic, really it is that I detect too much spin in his statements and that they lack a real getting at the truth. Any amount of spin from a Vatican spokesman totally annoys me. Whatever the merits of the original story, I find it unlikely that there was much of an investigation into this. Such an allegation should be strenuously investigated as it is matches totally the criticisms of the Curia from Pope Francis. See Dr. Peters post on this story It was worse than a crime–it was a blunder.